No matter how old you are a little mother love can help you feel better when you're sick. Tracy came down to help Erin move her stuff and ending up feeling much worse by evening. She had planned to go home last night, but just didn't feel like making the drive so crashed on the couch. I was up at 4 and even though she's 50, she was as pitiful as a 3 yr old, had not slept all night, was running a fever and a bit weepy. I fixed her up with hot tea, cough drops and mother love and now she's snoozing away. She should have stayed home yesterday, but she's seriously hard headed and determined to help Erin. Yesterday's move went well, all furniture and boxes now stored in the garage of the new house and the whole thing took only a little over 2 hrs. And (drumroll), the painting has begun. 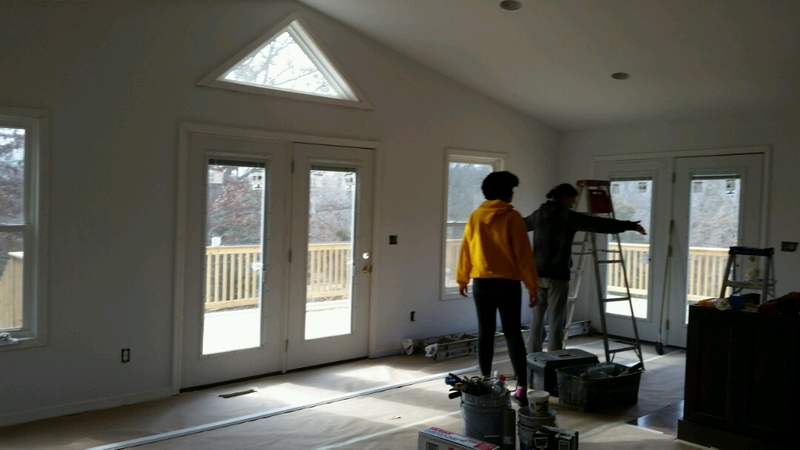 Trim complete and bedrooms plus baths cut in, and they'll be back today to do the walls. So progress again. Everyone feels better when the work is moving forward. Lest I forget, Anah had been complaining of a pain in her elbow. When it didn't resolve Erin had it looked at and they did an x-ray which revealed what the husband had said all along-tennis elbow. He once suffered with it and her description was quite similar to what he experienced. We thought it had happened the day she bench pressed 50#, but apparently about the same time they had some outside time at school and she was walking on her hands. I swear that girl is so accident prone, it's not funny. Glad it's not serious, rest required but won't interfere with soccer. Picked some spinach yesterday, more to pick today and the lettuce is up. Thinking maybe it might be time to put in beets, chard and kale. That's it from my spot on the planet, wherever you are may your day be sweet. duct tape that kid in bubble wrap? radishes do well in the cool. it does work well as a windbreak if she has to work in a place that can't figure out the doors should be closed when its below freezing. but you don't need to worry about it down there.